Can You Help Us Raise Awareness about Canine Epilepsy? It’s Not Too Late to help us by translating our 5th Anniversary ad and/or placing it in your club news to help increase awareness about canine epilepsy. Until the day we have a screening test the sharing of information is vitally important in the fight against canine epilepsy. UPDATE: Ads and translations of our 5th Anniversary Ad have been received from the Netherlands , Germany and Belgium and coming soon from the Czech Republic . The Finnish ad was previously received. 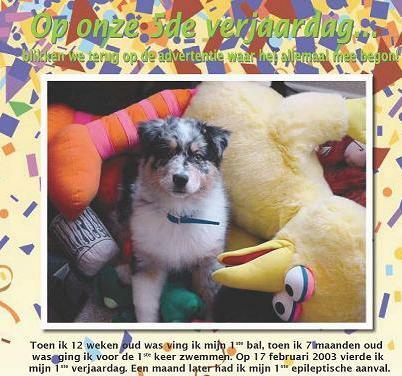 The Netherlands : Noelle Hoorneman has translated our 5th Anniversary Ad into Dutch and the ASCN, the Australian Shepherd Club Nederland has placed the ad in their journal December 2009. We thank Noelle and all the members of the ASCN for their support. The Dutch version of our 5th Anniversary ad is now up on our website. In addition the editor for the ASCN journal put together a full page ad In Memory of Toby. We very much appreciate this. Thank you to all those involved in doing this. This Memorial ad will soon be added to our website. Germany : Elke Philippy has translated our 5th Anniversary Ad into German for her club Newspaper “Der Aussie”. We thank Elke and all the members of the Australian Shepherd Association Germany e.V. for their support. The German version of our 5th Anniversary ad is now up on our website. In addition ASAG is holding a workshop in the spring 2010 about epilepsy and plan to donate an amount from each registration fee to Toby’s Foundation to help us in the fight against canine epilepsy. Thank you to the ASAG for this. It is very much appreciated. Belgium : Nadine Moinil has translated our 5th Anniversary AD into French for us. We thank Nadine and the members of the ASCB for their support. The French translation is now up on our website. Czech Republic: Martina Hodkova has translated our 5th Anniversary ad into Czech and the members of KCHBO, Klub chovatelu belgickych ovcaku has agreed to place the ad in the next issue of their club magazine. They are also writing an introduction to the members of the club about Toby’s Foundation. This is a club that is for both the Australian and Belgian Shepherds. The Czech version of our 5th Anniversary ad will soon be up on our website. Finland: Anneli Valkonen volunteered to translate our 5th Anniversary Ad into Finnish for AussieUutiset. We thank Anneli and Tuula Kuokkanen, the managing editor. The Finnish version of our 5th Anniversary ad is up on our website in its permanent location in our ads section. It was previously featured in our Spotlight section. All new ads are placed in our Spotlight section on our home page at www.tobysfoundation.org and all ads are permanently placed in the ads section of our website at www.tobysfoundation.org/ads.html. Please email us at tobysfoundation@tobysfoundation.org if you have any questions or are interested in translating our ad and/or placing it in your club news. We can send you what you need for the ad. Thank you. Coming soon…March 26th is Purple Day! Purple is the international color for epilepsy. You can help support epilepsy awareness globally for canines and humans by wearing purple on that day. We are partnering with www.purpleday.org for this global initiative!